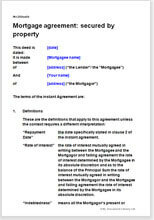 This comprehensive deed of mortgage sets the terms for the relationship between a Mortgagor and a Mortgagee in respect of a Mortgage secured by Real Estate. This mortgage document, as drawn, safeguards the interests of the Mortgagee. However, there is scope for small edits to favour one party at the expense of the other if that is required. This mortgage deed agreement is suitable for banks and money lending firms, any person or company in the financing sector, including lawyers and business professionals.